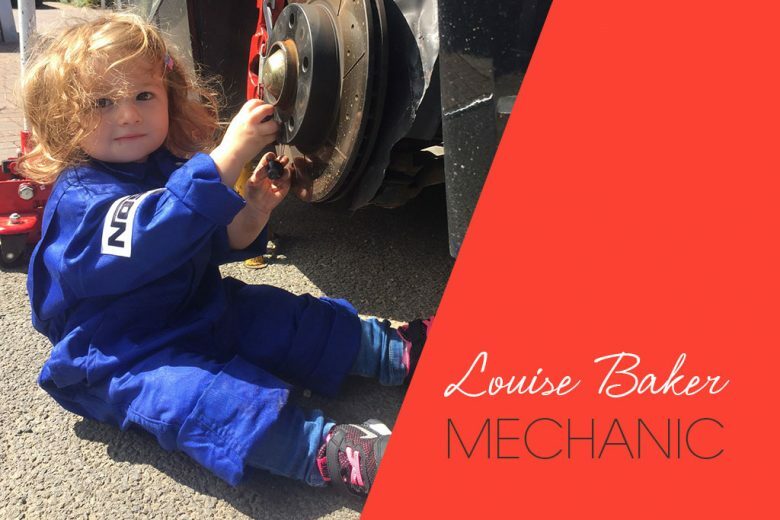 Read how mechanic Louise Baker turned her passion for cars into startup business Womanic, offering collect and deliver MOTs and repairs in Birmingham. My first job was flipping burgers in McDonalds. I lasted all of two hours. Deciding this wasn’t for me, I walked out. I was 16 at the time. I needed a job at 16 as I had brought my very first car, which I was repairing and modifying ready for when i passed my test. I went through many areas of work, mostly retail and at 18 I applied to ask Fletchers Autostore to sponsor a car enthusiast club that I had started at the time. They agreed and also offered me a job in their car modifying department. I was here for a number of years and it was the best job I ever had until I was made redundant. From then on I had gained so much experience that I moved onto management roles in the automotive business, including running my very own service and MOT garage for five years, and then onto being an automotive sales manager. Starting my own business is something that has always been in the back of my head but I never had the guts to really go for it. I brought my first house in 2010 so this made it more difficult as I had a lot more responsibility and a lot more to loose if it went wrong. I started working as a night manager for a well known retailer. The stress of working for people who really didn’t have a clue about there staff and the frustrations I faced when trying to get a better working environment for myself and everyone else drove me insane. I hit a bout of anxiety simply through not been able to express my voice and opinion and through not been able to make a change. It is here I met my now partner and in 2014 I fell pregnant with my daughter Ava. She is a mini me, my best friend and when I think of jobs I have had and people i have worked for – although I have learned a LOT and had varied experiences, I never want her to work for anyone but herself. She is already very independent and is only two years old, very strong, inquisitive and loves to learn. So I decided to take the leap and start up Womanic. Where did the idea for Womanic come from? The idea is something I have toyed with for a number of years. There is a massive gap in the market for female car mechanics as for some reason we just don’t do it. Although a male dominated area, it lacks a little finesse and sophistication. Banter talks are very one-sided and I’d like to change that. I did a little research and found that so many people have such busy lives, they find it hard to plan in servicing and MOTs and when it all goes wrong on an MOT, its hard to find the time to get repairs done when using the car for work etc, which is why I offer a free collection and delivery service. I will collect and deliver anywhere in the Birmingham area. So if you need the car for work on a Monday, you take it to work, I can pick it up from your work and drop it off before you finish – all fixed. You’d never know it had gone. Women will also find it much easier and much less intimidating speaking with another woman who knows what shes talking about. They have no need to walk into a garage full of the unknown. They can just call me for a chat, email or ill pop round to discuss what they need 1-2-1. I’ve been working in the trade now for over 15 years. I’ve serviced and repaired friends and families cars in the past and a few recommendations. Recently it built up so much I thought why not make it a real thing and setup so that I can advertise and make a better future for my daughter. My unique selling point is obviously that I am a female mechanic. Although I do try to beat any quote given as I have no overheads from premises etc (although I do have vehicles to run and insurances to pay). Aside from this I also offer collection and delivery in the Birmingham area which isn’t unheard of, but isn’t very common. My target audience is the female majority, however I’ve not ruled out men, as some of them are not as clued up as they seem and there are many these days who do not like to get their hands dirty. Although some men find it strange coming to a woman for car advice and repairs, others like it and have done it. How do you spread the word about Womanic? At the moment I am learning the social media side and I have started promoting on Twitter, Facebook and Instagram. Things are going well I am getting the word around about what I do and what I can offer. I am hoping to do my own online tutorials and videos as well to show people what to look for when something is wrong with there car or van and I will also post when I repair a vehicle so people can see what I do, which is also good for the customer. Hopefully this will gain traffic to my website once it is built and get my name out here even more. So far, stickering my car up with my company logo gets me some great attention but also Instagram I have found to be one of my most captive. My biggest obstacle so far is balancing my time. I am still working nights 30 hours a week until I know I will be successful enough to leave. So trying to spend quality time with my daughter and trying to build this venture up is very demanding, but it will be worth it in the long run I hope. My biggest success so far is seeing peoples reactions and how supportive my friends and family are. Everyone is retweeting, commenting and spreading the word which is making me feel so humble. Its always good to better yourself and want more. Its not being greedy its more about wanting a better life. I like to travel, explore new things and people. I’d hate to plod along day to day in Tyseley, Birmingham eating, sleeping, dreaming. I like nice things and I want my daughter to know that things like this don’t come for free, you need to work hard and then the sky’s the limit. My dad inspires me. He’s tought me so much over the years. He got me into cars at a young age but his health has deteriorated over the years. He is a grafter and used to work all hours to make sure my mum, sister and I always had he best, but he never shied away from being a great dad. It’s very hard as like i said before. I am still working 30 hours but working nights allows me to not miss as much time. Although sleep is hard to get hold of i have to look at the bigger picture. For Instance here I am at 5am writing this article, but every bit of spare time I need to put in making this a success. My daughter starts preschool in November for two mornings a week, so this will help. And my mum also retires the same month, so she can also help when needed. But for me Ava comes first. I spend as much time as possible with her as she is my number one priority, and she goes most places with me. She is learning fast! Don’t wait too long. I have been business minded since I was around 19. I am now 35 and have only just built the courage up to do this. Don’t waste time, you have an idea, run with it. Whats the worst that can happen? Use the people around you – everyone knows someone that does something. Use your contacts. I have known some people for years and have built great reputations and relationships with them. These will help and have helped me a lot in starting out, and you can return the favour. They made need you in future. Keep with the times. Cars and people are forever changing. Learn where possible anything you can in your area of expertise. Knowledge is power. For me everything comes down to experience. Places I’ve worked, people I’ve seen, things I’ve learned along the way, be it mechanical, relationships or business. I have just built up from what’s in my head and ran with it. Hopefully, it will work. You can find out more about Louise’s services on Womanic’s website.